The UK learner motorcycle specification is an engine size of up to 125cc and a power output of 11kw (14.6bhp). You must complete compulsory basic training [CBT] before riding a moped or motorcycle (with or without sidecar) on the road. However, you may ride on a road under the supervision of an approved instructor as part of that training course. Your motorcycle dealer or local council road safety officer can give information on local training schemes, or see adverts in local papers and telephone directories. From 1 January 1997 all learner moped and motorcycle riders irrespective of when a licence was issued must have completed a Compulsory Basic Training [CBT] course before riding a moped or motorcycle on the road. learning to ride a motorcycle and who have already obtained full moped entitlement as a result of passing a moped test on or after 1 December 1990, or riding a moped with full entitlement given automatically with a full car license. After 1 February 2001 when you successfully complete CBT you will get a Certificate of Completion (DL 196) which will be valid for 2 years. Certificates issued prior to that date will be valid for 3 years. Keep your CBT certificate safe because you will need it when you apply for and take your moped or motorcycle theory test. You will also need it when you apply for and take your moped or motorcycle accompanied test, and you may need to show it to the police if required. If you have any enquiries about CBT phone Driving Standards Agency on: 0115 901 2500 and ask for the CBT section. If you are learning to ride a moped or motorcycle, you cannot carry a pillion passenger. you are over 19 and accompanied by an approved instructor on a separate machine at all times, or you are riding a motorcycle with a sidecar . can be moved by pedals, if the moped was used before 1 August 1977. Any enquiries about CBT should also be referred to the DSA. Learner motorcyclists normally have to pass the written theory test as well as the practical test to gain a full motorcycle license. The test consists of 50 multiple choice questions the pass mark 43 out of 50 you will be allowed around 40 minutes to complete it. There are some 150 theory test centers throughout the country. The theory test fee is £21.00 and can be booked via the theory test button above or by calling 0300 2001122. Since 19th January 2013 new rules apply. 17-18 you can take your test on a 125 cc motorcycle, once you have passed you can remove your L plates and carry passengers however to ride larger motorcycles you will then have to be 19 or over and take the test again on a larger motorcycle. If you have taken the test at 17-18 you will not need to take a CBT or theory test again just 1-2 days training for the A2 licence. To gain a full A1 light motorcycle license you must successfully complete CBT and pass a theory test followed by a practical test on a maximum of 125 cc . A full A1 license permits you to ride any motorcycle up to 125cc and a power output of up to 11kW (14.6 bhp) without `L' plates, carry pillion passengers and use motorways. To gain a full standard category A2 license you must successfully complete CBT and pass a theory test followed by a practical test on a motorcycle of 46.6 bhp. A full standard category A2 license permits you ride any motorcycle with a power output of up to 46.6 bhp without `L' plates, carry pillion passengers and use motorways. To ride a larger motorcycle you will then after two years or at 24 be able to take the test again on a 650cc motorcylce in order to ride any bike. If you have taken this test and wish to go onto DAS you will not need a CBT or Theory test just a further 1-2 days training on the larger motorcycle. Riders aged 24 or over may opt to take a test on a large motorcycle. On passing the test they are immediately qualified to ride any motorcycle without restrictions. This option is called Direct Access. You must complete CBT, and if necessary, a motorcycle theory test and a practical test on a motorcycle of around 650cc. So that learners aged 24 or over may practice for the large motorcycle test they may ride a motorcycle on the road that exceeds the UK learner specification, but only under the supervision of a certified Direct Access instructor. When learning on a large motorcycle the usual learner restrictions will apply (`L' plates, no pillion passengers and motorway prohibition). The power output of an engine is measured in kilowatts (kW) or brake horse power (bhp). A kilowatt is the metric measurement of brake horse power. One brake horse power equals 0.75 kilowatts. Engine capacity (or size) is measured in cubic centimeters (cc). The size of an engine is not directly related to its power output. 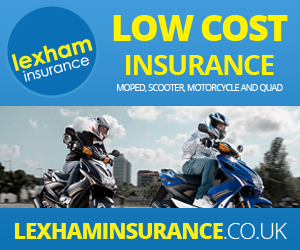 Further information may be obtained from motorcycle retailers or manufacturers. A1 and A2 Restricted license, Scooter and Moped lessons and Advanced Courses.